France has one of the best railway systems in the world. The network is accessible, affordable, and quick. It puts to shame many of its European neighbors, to say nothing of the mess on the other side of the English Channel. It also happens to be nationalized, and employees benefit from a special employment status that provides enhanced job security and early retirement. The arrangement has long angered business elites and right-wing governments — which, naturally, means it has become a subject of “reform” efforts by current President Emmanuel Macron. Fresh from overhauling labor law in favor of employers and slashing taxes on the ultrarich, the former investment banker who dreams of transforming France into a “start-up” nation is on to his next move. On March 14, Prime Minister Edouard Philippe formally unveiled legislation that would abolish rail workers’ special employment status and lay the legal framework for future privatization of the French National Railway Corporation (SNCF). The latter goal comes amid directives from the European Commission to allow private-sector competition on commuter rails by 2020. Under the government’s proposal, the SNCF would see its legal status shift from a public company to a “publicly financed” corporation. Previous administrations have applied the same move to the postal service and to France Télécom, the latter of which has since been fully privatized. But the government’s chief target is the railroad worker “statut,” the special employment status that applies to 140,000 employees of the SNCF. Under this system, employees cannot be laid off for economic reasons and they have the ability to retire earlier than most of the French workforce. While the general retirement age is 62, SNCF conductors can retire at age 52, and other railroad personnel at 57. As most trade unionists and left-wingers readily acknowledge, the special employment status by itself is a tricky thing to defend. By definition, it applies only to railroad workers, just as journalists, doctors, and civil servants have statuts of their own. At a time when many young and working-class people are mired in precariousness and unemployment, sympathy for rail workers and their employment advantages isn’t exactly widespread. In fact, a recent poll showed nearly 7 in 10 favor eliminating the statut. The president and the cabinet understand what this means. Successful passage of the reforms depends on isolating rail workers from the general public — on painting them as privileged vestiges of a bygone era who need to wake up to the realities of the modern, globalized economy. Tellingly, Prime Minister Edouard Philippe chose to ignore other sweeping railroad budget cuts recommended by a government commissioned report last month. Overseen by former Air France CEO Jean-Cyril Spinetta, the report called for eliminating service in rural and low-trafficked areas, sparking backlash from across the political spectrum. The cabinet felt this was a step too far: service cuts risk rallying people to the side of railroad workers and their unions. Either way, critics maintain those other railroad reforms are still in the pipeline, whether they’re proposed now or later. Such an approach would be in line with the government’s divide-and-conquer mentality. Since winning the presidency last summer, Macron has pushed his various reforms quickly but carefully, timing their release so that the inevitable flickers of resistance don’t ignite into something bigger. 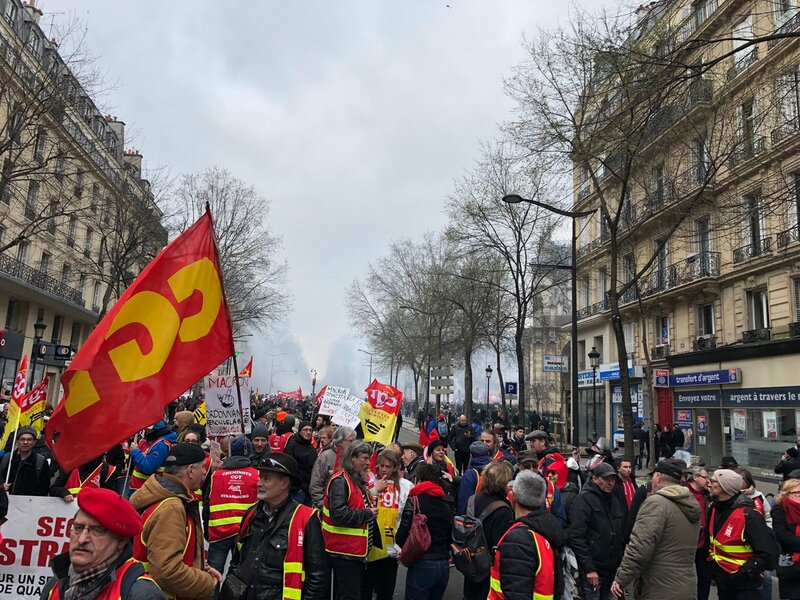 Over the last year, France has seen a series of small protests from trade unionists, students, and retirees, but nothing resembling large-scale social movements of the past, like in 2016, 2010, 2006 or 1995. The question is whether the government has finally overplayed its hand this time. There are signs this may be the case. For one, rail workers have a long history of collective struggle and are among the most militant sections of the French working class. Secondly, the reforms coincide with growing agitation among civil servants. Even before the rail reforms, public-sector unions called for a day of strikes and protests on March 22, in protest against pay freezes and 120,000 looming job cuts. United in defense of their job standards, railroad unions have unveiled strike plans of their own. After joining civil servants on March 22, they plan rolling strikes from April 3 to June 28. Workers will engage in a series of two-day job actions separated by intervals of three days, amounting to thirty-six total days of strikes. The plan benefits from rare unanimity from organized labor, with moderate unions UNSA and CFDT on board with the more combative CGT and Sud-Rail. (The latter says it will also push for rank-and-file workers to decide further strikes in general assemblies.) Still, no matter how effectively unions manage to block the rail network — and if they mobilize their members, they have the ability to do so — an isolated movement is unlikely to force the government to relent. Railroad workers need sympathy from the broader public. Only by joining forces with civil servants and others disaffected with France’s political and economic status quo do they stand much of a chance. There is a pool of potential allies. Students are facing the prospect of restrictive admissions procedures, retirees are dealing with benefit cuts, and much of the working class is grappling with systemic job insecurity. A mass movement that unites these groups is probably the only way for railroad workers to defeat the reforms — and likewise, an opportunity for others to achieve political victories of their own. Naturally, commentators have begun to reference 1995, when rail workers led a mass movement of strikes and protests to defeat proposed public-sector pension reform. The labor movement was a more powerful force back then, boosted by an ability to mobilize nonmembers on a scale it struggles to replicate now. But as in 1995, the message of a successful movement today will have to appeal to larger social values: the defense of public services, the protection of decent job standards, and the importance of working-class solidarity against a government that views such matters as obsolete. In the end, despite what the prime minister says, railroad workers make just about average pay.